When all your employees are under the same roof, it’s easy to get the group together to collaborate. But when your employees are working remotely, how do you pull everyone together? With ZAC (Zultys Advanced Communicator) you can pull your team into the same virtual room. 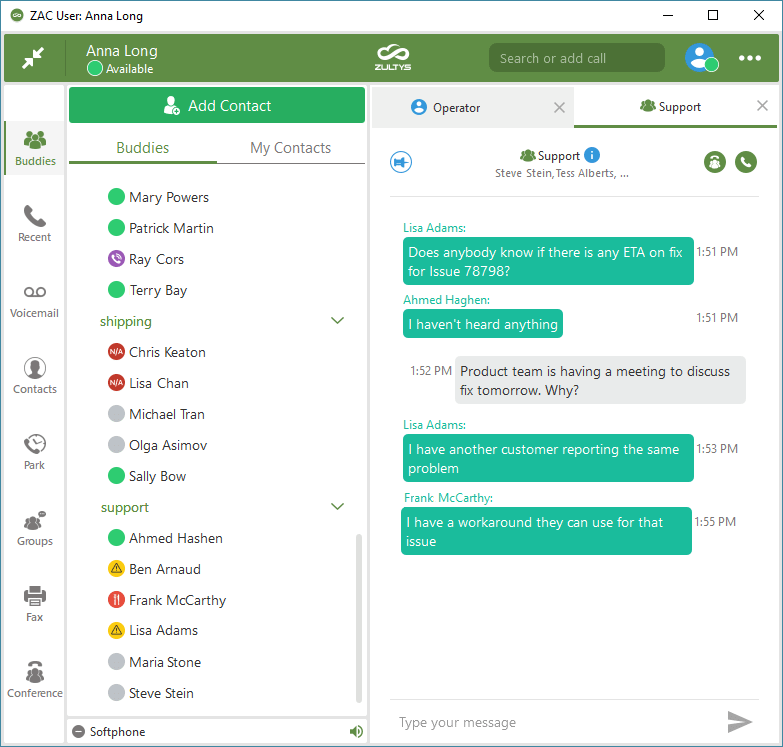 ZAC incorporates all the interoffice communication features—presence status, secure group chat, web conference, drag and drop call operations—into an easy to use collaboration tool. Communicating and collaborating locally or remotely has never been easier! ZAC’ Group Chat (Team Messaging) feature is a virtual conference room to collaborate. Group Chat allows for an intuitive and integrated method of communication between teams regardless of their physical location. Send secure instant messages between team members whether they are using ZAC on their desktop or Zultys Mobile on iPhone and Android devices. Adding a new member to the Group Chat takes seconds with an easy drag and drop operation. Team members can post ideas, proposals, and tasks and be assured that the entire team sees them. With a simple click, any member of the team can start a conference call and employees can freely jump on and off the call at their convenience. ZAC users can browse contact information for all employees on the phone system. Each person’s current availability status is displayed with an icon next to their name eliminating the availability guessing game. Incoming calls can be transferred to coworkers simply by dragging and dropping the call to the coworker’s name in the buddy list or the employee directory. 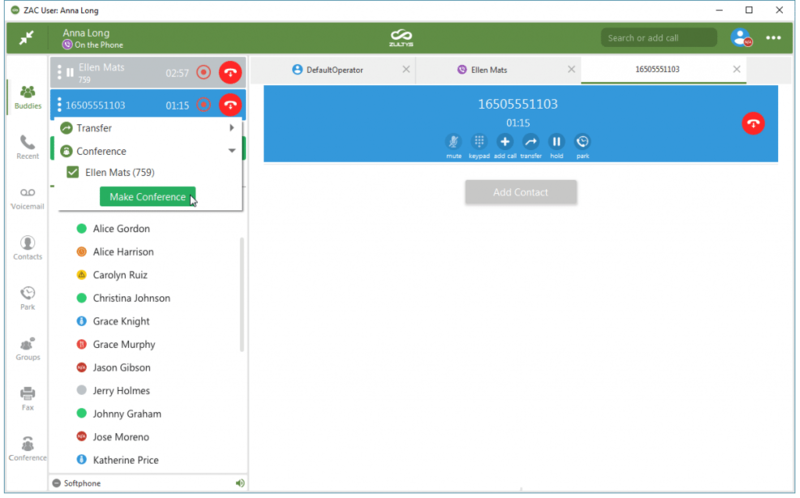 ZAC’s visual interface makes managing multiple calls a breeze, as individual calls appear as separate tabs in the application. Users can create conferences on the fly at any time with a few button clicks. Manage Voice and Fax Messages. ZAC’s visual voicemail interface eliminates the hassle of listening to messages in the order they came in. If an employee can tell from the first five seconds of a message that it’s meant for someone else, it can be sent to the correct person right away. No need to listen to the full five minutes of recording or navigate a complicated menu. 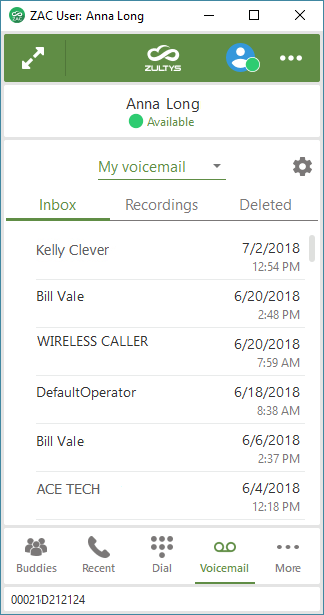 The transferred message will appear in the coworker’s voicemail inbox instantly and can even include a quick note from the employee who made the transfer. ZAC can send and receive fax messages straight from the application from anywhere, with no need for an office fax machine. Incoming faxes can be viewed in ZAC or email and transferred to other employees if necessary. The company can save on both expenses and time. ZAC supports a range of Operator Groups and multiple levels of Agent Roles and lets users log into multiple roles simultaneously. An employee logs into their Agent role to receive calls for the Call Group. 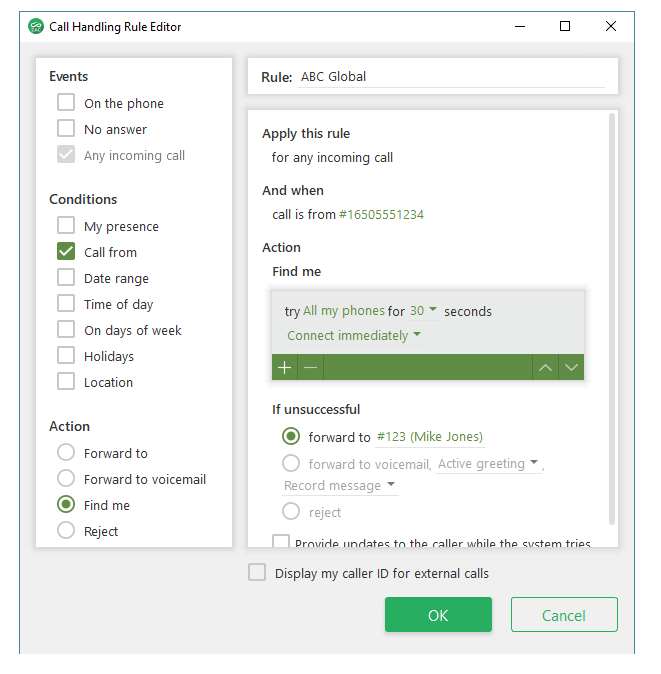 Incoming call group calls are distinguished from calls to their user’s extension, so employees can adjust their greeting accordingly. Agents can make outbound calls with the Group’s caller ID. With ZAC, employees can configure call handling rules that will automatically route incoming calls based on predetermined conditions. For example, calls from important clients will always reach their account manager: forward these clients’ calls to the manager’s cell phone, or immediately redirect the calls to another employee if the account manager happens to be on vacation. The Find Me/Follow Me feature allows the system to ring up to 16 different phone numbers to reach the employee for an important phone call or to notify them of an urgent message. Ensure that the callers who really matter will always reach a live person.